I keep on wondering if I should do yearly round up too but I don't really feel like it. I would have to tell you about my split personality some of you are aware of, lol. I run two blogs. I used to blog in two languages but it is actually easier for me to split and do it separately. I'm actually quite happy with this all English blog of mine and the way it's growing going. None of you ever complaint about my English so I assume you do understand the words that coming out of my keyboard, he he. Yesterday I finished those two cushions. I tried to catch up a bit of sun (direct light) but next time I'll be wiser since I read this helpful tutorial by Anne. I also took a picture at my mom's place so you can see how well it fits into her interior. Besides cushions December was filled with Christmas making. In my case Cherry Christmas. I made this collage using PicMonkey and changed my mind and created few more. Have you ever tried to take picture by left hand while holding something in the right one? That's right. My mom and dad got new cushions for Christmas. I haven't pieced those circles. It's all print, local no brand fabric. I quilted some straight lines and added zipper to the side and managed to make 3 in time. I promised to make 2 more. I hope everyone enjoyed their Christmas. We sure did. My two girls at MIL's place. Guess what. I'm testing out our new camera. Canon G16 and I love it :-) We have no snow and it feels more like Easter. Got to go play with the new toys ... I'll sneak some sewing in later on. I wanted to continue in cushion making but can you believe I need to get white thread. I had some tension issues with the one I got which is cheap kind so new thread addition is quite essential. Time for plan B. I mean check the list and see if there is anything else I'm able to complete. As there are only few hours days left let's be realistic and just smile on some of the projects on the list :-) Those for me were not important anyway. 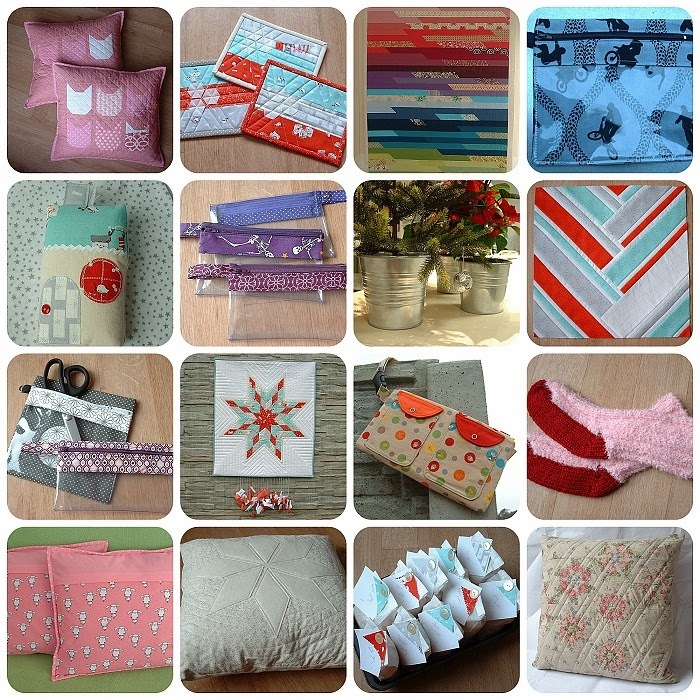 I'm glad I joined the Making Christmas blog hop as it was fun to be part of it and I'm happy with what I created. 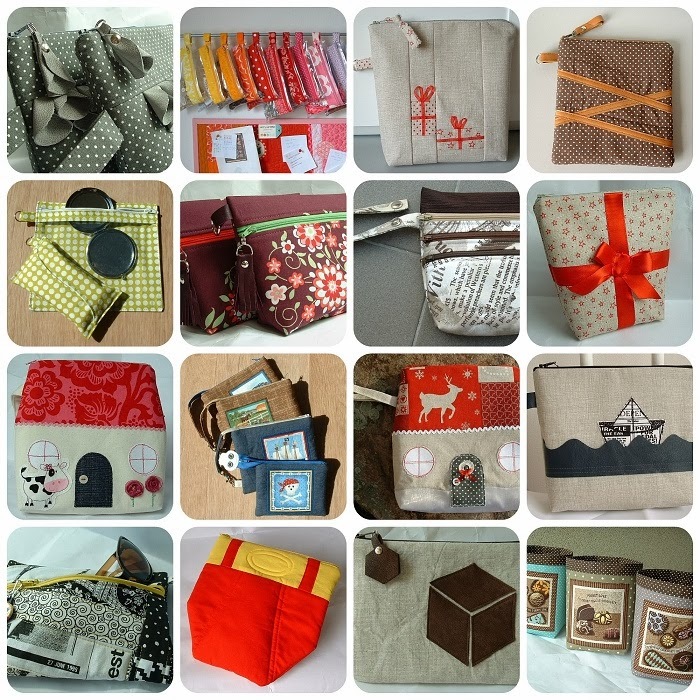 You might remember the vinyl pouches I made some time ago. Here is little addition in purple range. You can see the baby snap on the loop. That is how they are attached to the bar. Ready to be loaded. 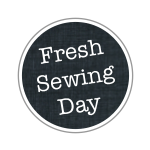 Last week I was going to Christmas meeting with my sewing buddies. So here are few shots. We had great time as usual and everyone was thrilled about the Christmas cookies swap. 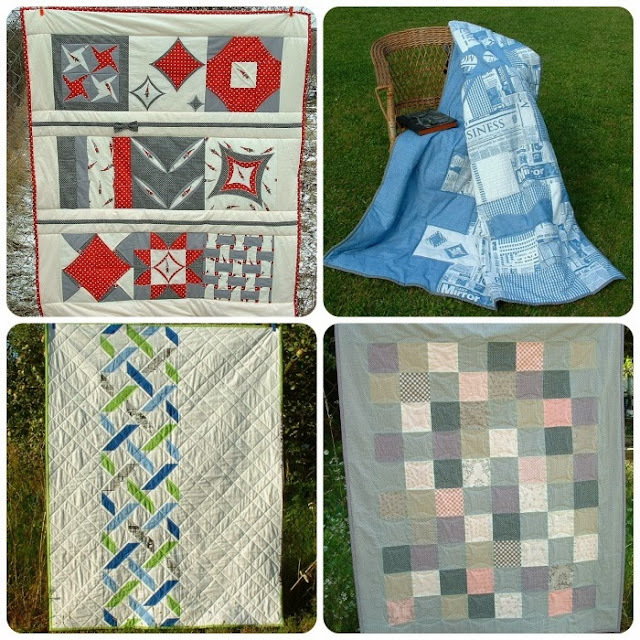 Linking up with TGIFF and Crazy mom quilts. For those that only visit on Friday here is little cushion collage. You can check the full post here if you are interested. I finish those this week as well. I'm sure all of you understood the need of cat pillow #2 so I went to work and ended up with 6 cats. I was running out of the pink fabric so I actually needed more. You can find the tut for basic cat block here. I also wanted some Christmas kind of pillow to go with our Cherry Christmas Lone Star. I used three jelly roll strips and brushed off the Broken Herringbone block. Except I alternated full width with just a half width. This is currently WiP since I'm a bit undecided about liking or not. The white part is meant for some FMQ whatever. Believe or not the above block is a bit too random and out of order for my current liking :-) that I left it and started something snowy and in the right winter colors. I picked those fabrics locally. The base is white with some silver print on it. White and silver are the colors we go for our Christmas tree as well. I quilted in spiral at first and added some fusible fleece appliqué on top. I got this idea from Amy. The spiral is of center on purpose. The star is of center as I did not measure, ooops. True negligent style. Let's be honest here the fusible fleece isn't something you want to sleep on. I like the idea of no fraying ends but I want to use it as well. Not just a pretty decoration right. So if you want to actually use it you need to turn it for the plain back. Therefore I installed the zipper into the side seam. I used this tut shared by Gemma. My first attempt is not perfect and I managed to sew over the zipper pull so I actually couldn't open it, lol. It was an easy fix and I'm glad I gave it a try. I'm a bit running out of time with my Christmas making so we'll see if there is anything else happening. When it comes to precious we usually think about our kids. I'm sure every mother has that kind of association. So my girls are the most precious thing in my life. Let's create something for them. We like cats and we like pink so it wasn't really hard to choose the theme. Is that a rhyme or what, he he. 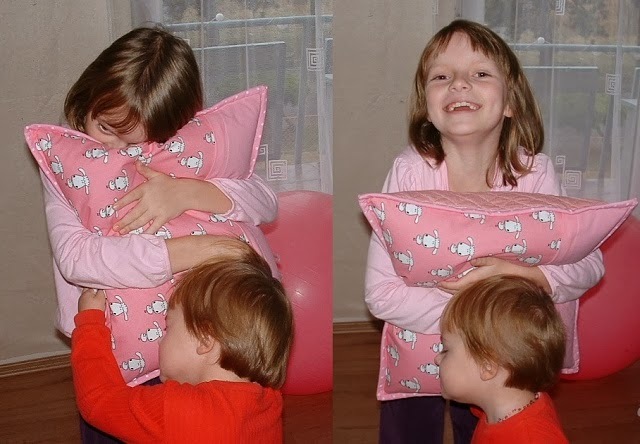 This is first pillow I tried to bind. Using the tut MsMidge provided. It's fab! Love it. So easy and quick. Check out the details. Not bad for a first try. The only thing I do differently is joining. I finally learned how to join the binding ends with 45 degree angle. I stumbled upon this tut and finally understood how to do it. It is so easy when you have the right directions. Since the pillow is for my girls I used some cute fabric for the back side. Local no brand in case you wonder about the fabric line. My girls really seems to like it. It fits for the Cushion for Christmas blog hop as well as for the precious Le challenge theme. It's already a win win. There is only one problem. I have two girls and only one pillow. From time to time I like to be pattern tester. 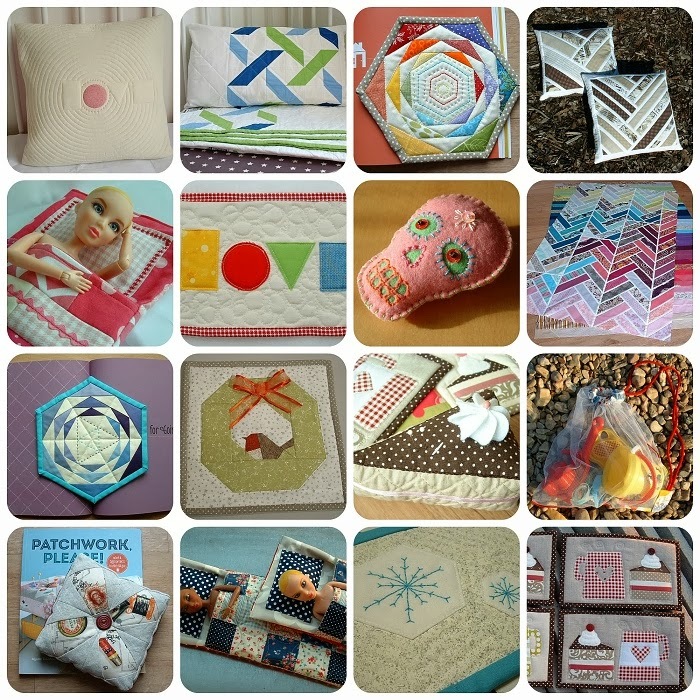 I was lucky enough to get into the pattern tester group for Sara of Sew Sweetness. Her latest bag is called Beatnik waist bag. 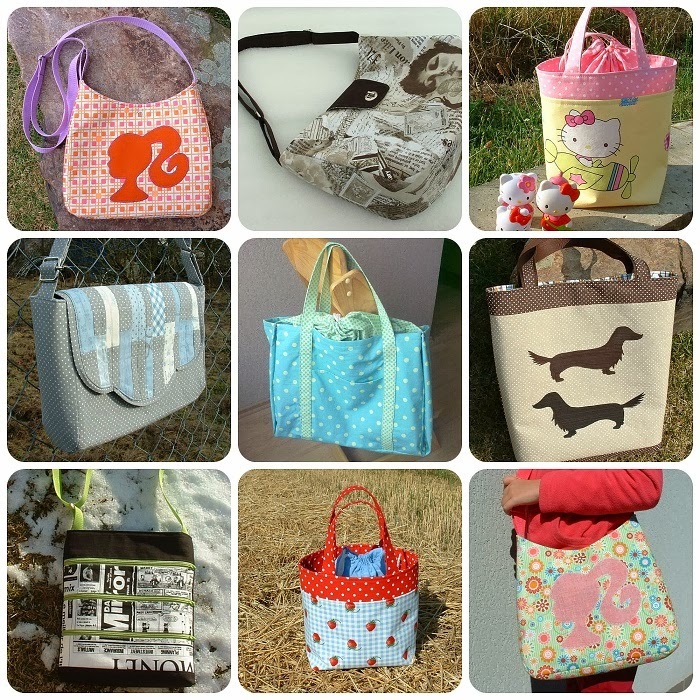 Check out the other versions of this bag on her site. It's always great to see how the others made their versions. I played with the color acent of red and orange which is featured on zippers as well. The fabric I used is called Fox Trails by Doohikey Designs (Riley Blake) and it's really cute and fun. I was thinking about some kind of small bag for our walks or when we just going outside. This is perfect solution. There are many pockets. More than you would expect. Besides those flap pockets on front there is zipper pocket on the back and pocket divider which makes two small pockets inside the bag. Sara's instructions are easy to follow and understand. Today is the last day of Sew Sweetness Bag Contest over at Sew Mama Sew so this seems as perfect timing and great opportunity to link up. All packed up. I'm not usually very good at fancy packing but look at this. I really outdid myself. Each of them has little note. I started with the usual Merry Christmas and ended up with World peace sort of :-) Little scrap of Cherry Christmas and a button equals all set. Here's the ornament I made. My fav part is this birdie in the window. Big present at the back side. Some of you might remember my trial of kaleidoscopes or the one block wonder blocks. Anyway you like it. Well those roses are not really my style so it's going to one of those sewing buddies. I found a good home for it. I went with very simple quilting and I'm quite please with the result. The original fabric as perfect back side. I have also finished the cat pillow. You could see the front panel on WiP and here's another sneak peak. I'll link that up with Le Challenge as I consider pink to be quite precious. Yeah, that's the theme for this month: precious. Linking up with Making Christmas, TGIFF and Crazy mom quilts. I will also link up to Cushion for Christmas blog hop once the linky is open.